Just wanted to share some quick bottle pictures of these new Misa nail polishes I got today! The collection is called Surreal Escape and I'm assuming this is the Fall 2011 collection, but I'm not entirely sure. The most important thing is that THERE ARE DUOCHROMES. MISA IS DOING DUOCHROMES AGAIN!!! Grey Matters, Spaced Out, Beyond Infinity, Phazers on Stunning, The Great Green Whatsit, Shields Up. Closer look at the duochromes. Each of these have some fine silver microglitter in them. Shields Up looks like it could be a good OPI Not Like The Movies dupe. Haven't tried it on my nails yet. It's been over a year since I last posted a Misa polish... I kinda fell out of love with them after all the weird wordy cheesy ad copy and safe, conservative colors... But now I think I might be falling back in love with them. Oh, they all look so pretty! I love duochromes! the bottles on their sides make the polishes seem sheer! or is it just me? anyway, i hope they aren't! they look great otherwise. YES! I just saw these on nailsupplies.us yesterday and alllllmost ordered them. But then I was like "noooooo, I'll wait for Scrangie to swatch them and say which ones are good." OMG I think I want them all! No no no no no. You are killing me Scrangie! These look potentially very cool. I almost hope they're not because I've been on a polish buying spree. Yikes! yaaaaay :) waiting on the swatches! I can't wait for this collection! Very excited to see these. I haven't bought Misa in awhile. There really hasn't been anything that really moved me to buy it. These I'll will certainly buy. Those last three look amazing. I'm loving this collection just by the names alone! I think I'll get them all! Hot damn! I lovelovelove duochromes. So excited to see you swatch these! I bought the previous collection: Hip to my Jive, and I loved it! The colors are very nice and the quality excellent! I must admit the colors were nothing extra ordinarily different, but they were a must for my boring self! And I just ordered this new collection, too! Misa has never really done anything for me.. but this collection has the potential of being a love story. Looking forward to swatches. Can't wait to see the swatches!!! Last three ones are stunning! Oh my.. I think I want them all! I have all but the grays, and I am so excited by the colors!! I wonder why thet stuck two grays, but yay for those duochromes!! I was hoping for some fun duochromes for fall! Luckily Misa did not disappoint! guuuh!!! WHY aren't they easier to find in the UK? Scrangie, you had me at duochrome! 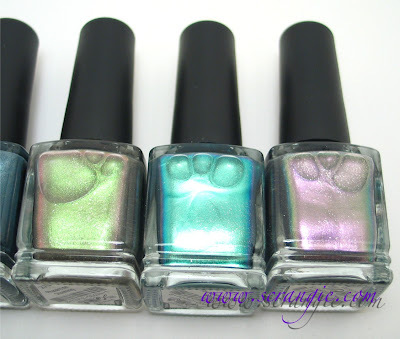 :D I'm going to have to start buying Misa polishes again if these are as good as they look in the bottle. Thanks for the heads up! FInally some Fall polishes worth drooling over. I'll buy the lot of them, not only because they're gorgeous, but so that Misa might realize this is what they should be doing. Are they big 3 free? I'll appreciate this info. My goodness, I love them all! Can't wait to see the swatches of these babies!